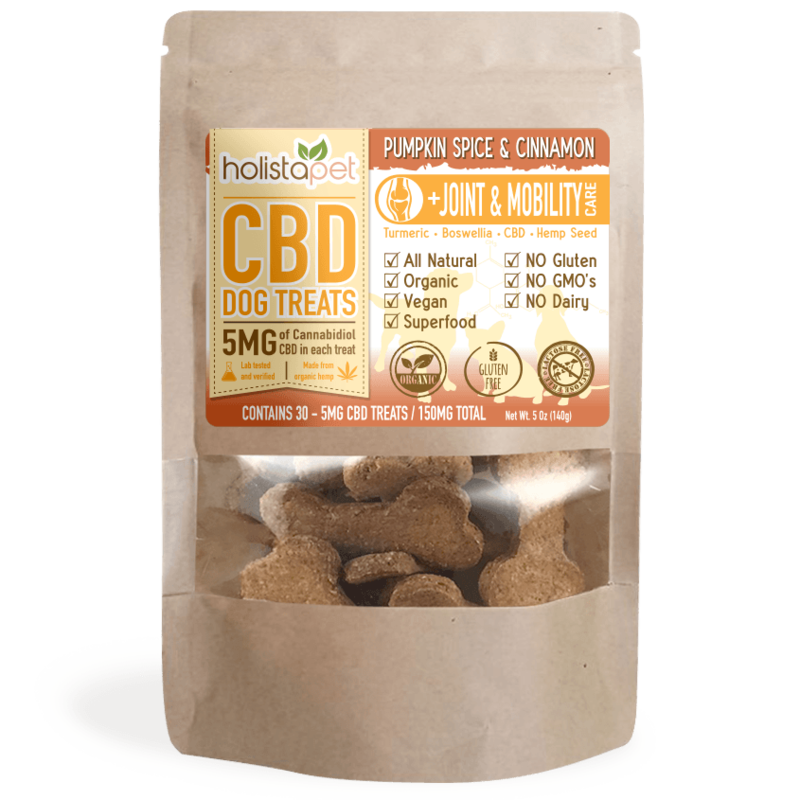 Our Pumpkin Spice + Cinnamon dog treats are specially formulated with Turmeric Root and Boswellia to increase strength in joints and reduce the pain and inflammation caused by arthritis or surgery. These unique ingredients combined with other key superfoods like Hemp Seed Powder and Full Spectrum CBD Oil are vital for helping your dog maintain good joint cell structure and mobility. Use this formula if your pet suffers from arthritis pain or from joint inflammation, hip dysplasia, joint & muscle injuries, pain from surgery, epilepsy or cancer. Boswellia – Repairs damaged tissue. Stimulates tissue immunity. Hemp Seed Powder– Highly concentrated in omega fatty acids and protein. 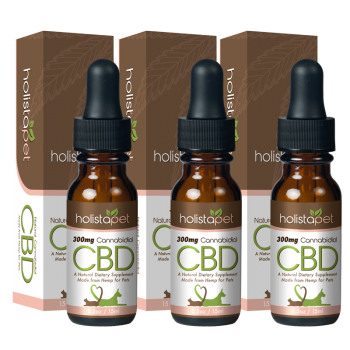 CBD Oil (Cannabidiol) – Helps to aid the relief of; pain, inflammation, arthritis, digestive issues, allergies, skin problems, seizures, nausea, cancer, tumors, anxiety and phobias. Promotes cardiovascular health, wellness & appetite. Suggested serving: One treat (5mg) per every 10 lbs of body weight. Repeat every 4-8 hours or as needed. Hey just wanted to ad my 2 cents. 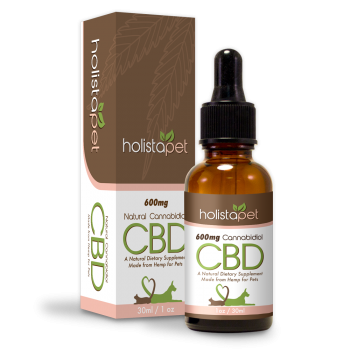 I’ve been giving my dog with arthritis these CBD dog treats for 2 weeks and I do notice a big difference. He is more active and more playful then before. He’s not all cramped up when he wakes up in the morning especially. I guess this to me is a sign that its working right? I ordered this product from your website and there was a problem with shipping.. Nick was super helpful and they sorted it out quick and got my product to me (it was a few days late but they took care of it) for that reason 5 stars! I’ll try to leave another review once I see the product working in any way. Happy dog, happy dad! I don’t want to ever let my dog’s old age get to me or him. I have been buying this formula for 3 months now and finally I can truly say that I have seen a big difference in my dog’s activeness and mobility. He can run and doesn’t drag his legs as much as he used to. Thank you guys for making an amazing product! Very well made product. will buy again. calms my dog and makes him chill the F out! Just got my order in the mail this and want to get a discount for my next order so I’m giving my review.. Product looks good as promised packaging is great with fast delivery. So far so good. Will be getting more for sure! Not a bad product at all. 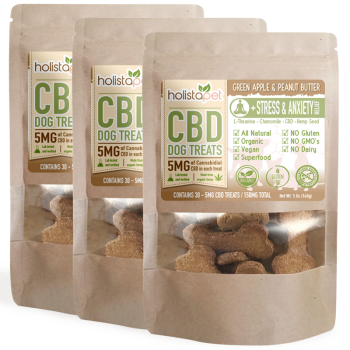 I have never heard of CBD until my gf introduced me to HolistaPet dog treats. My dog has been getting old and I’m pretty sure has some kind of joint pains. She doesn’t really play much unless you taunt her with food. She seems stiff in the rear limbs. Anyways these things have been doing her a lot of good. she is moving more and it has been a noticeable difference! Superb product will order more! These treats are really helping my dogs arthritis after a couple weeks and few bags. Wish they would come in larger doses for bigger dogs though. love that these are treats spcifically made for joint problems and have boswelia which ive heard helps inflammation as well as having CBD! Really fresh when you open up the bag they smell great. I can’t wait to have my dog try the other flavors he seems to like these quite well. He’s a picky eater too so that’s good. I’m giving it to him as a daily treat hopefully it will help him with his arthritis in his back legs. This is only the second day so I can’t really tell yet but he definitely likes the taste. My 2 year old Yorkie comes running for these things. P.S. I’ve been recommending your to my dog loving friends! Awesome products, awesome company, great customer service, can’t think of anything else to say. This stuff has helped my dog with bone cancer was told that he wouldn’t last 3 months. Well it’s now over 6 months so I think it’s really helping. I have just ordered my 2nd bag of mobility treats for dogs. My pup loves them. Although we made a couple changes to his meds/supplements around the same time I really feel that the CBD treat have been most beneficial in his pain control. My dog’s new favorite cookie! My 13 year old Chinese Crested is a picky eater and he inhales these treats. He’s less hesitant to move around after being on CBD for only 3 weeks. He has severe patellar luxation. I’m also giving him the tincture and the capsules but the treats are the easiest. Our poor doggo is getting arthritis in his back hip joints. These treats have been an absolute sanity saver. Doggo doesn’t need nearly as much medication, and has begun playing like a puppy again! Started using mobility for 12 yr old daschund. She is more active and mobile. I have been using the CDB oil for my dog for a few months now and love the results I have seen. When I ran out a friend of mine ordered the CBD dog treats for me and my dog LOVES them. She is about 14 years old and has hip/joint problems. Before starting the CBD treatments it was painful to watch her trying to lie down or get up from her bed. Not only is she moving much better, but she looks forward to getting her “treats” everyday. It’s nice to use as them as a reward instead of trying to sneak it into her food with the oil. I order the joint and mobility earlier After my 11 year old Yorkie had acl surgery earlier in his life he developed a constant limp and at one point could barely put any pressure on his right rear leg. After taking him to the vet they did xrays and recommended all these treatments and pills I decided to order the joint and mobility treats. After a week I noticed he has able to put 50% more pressure on the leg and after a full month of giving him the recommended dose he was able to put 100% weight on the leg and I actually stopped with the treats. He never did limp again, but sadly he passed away a few weeks ago. Prior to him passing I had placed another order for his anxiety and rapid breathing but the day after the order he passed. They gladly cancelled the order for me and even sent me card!! I’m a customer for life now! My 8 year old dog recently had a seizure. She was anxious and pacing after the seizure even while on gabapentin. I give her these treats in combination with her medicine and she has energy and is back to her cheerful self. They worked very quickly will continue to purchase these.